Persol 3110 Typewriter Edition - Honey Tortoise Need Help? Inspired by the antique charm of the long lost writing tool, Persol introduces the "Typewriter Edition" collection. These squared off combination frames have, a newly conceived metal bridge which is finished with refined laser engravings and features rivets inspired by the letters of the old keyboards. The name of the collection is written in the iconic “American Typewriter” font on the inner side of the temple with a fan-shaped pattern on the tips that helps prevent slippage. The three-cylinder Meflecto system on each temple ensures maximum flexibility, grip, and comfort. To commemorate the special edition each frame comes packaged in a premium leather chocolate brown pebbled leather case with suede lined interior. 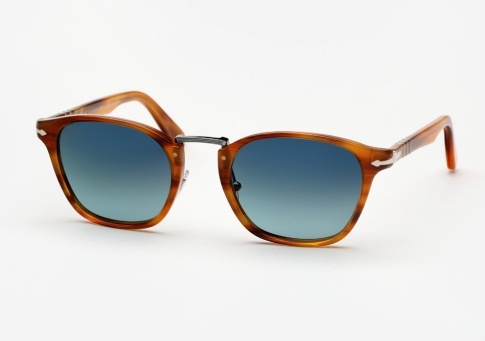 It is offered here in "Honey Tortoise" paired with blue gradient polarized lenses. Polarized lenses: virtually eliminates the effects of glare that bounces off reflective surfaces. Patent Meflecto™ technology offers maximum comfort through flexible temples and bridge.